A dramatic new view of the Earth has emerged from the first few weeks of the orbital checkout of Aqua, the satellite designed to study the world's water. Aqua has sent back pictures of sea-surface temperature and brightness. They are stunning. "After years of preparation on Aqua, I and hundreds of other scientists are thrilled to have the spacecraft launched and its Earth-observing instruments sending down high-quality data," said Claire Parkinson, an Aqua project scientist at the US space agency (Nasa). She added: "If all goes as planned, these data will lead to improved weather forecasts and a better understanding of Earth's climate system - especially the role of water in it." Aqua is a joint project between the US, Japan and Brazil. Its six sensors will study the infrared and the visible spectrum to determine cloud properties, sea-surface temperatures and ocean colour. As well as the water cycle, Aqua will conduct studies of the Earth's radiation balance. It will also look at small particles in the atmosphere, and trace gases, such as ozone, carbon monoxide, and methane. It also carries a sensor that will measure atmospheric temperatures with an accuracy of one degree Celsius in a one-kilometre-thick (0.6 mile) layer throughout the troposphere, the lowest part of Earth's atmosphere. Science data have currently been received from five of Aqua's six instruments. It is Japan's Advanced Microwave Scanning Radiometer (AMSR-E) which has produced the first geophysical product: a global map of sea-surface temperatures. Researchers say the instrument is an outstanding performer and shows the high quality of the detail the sensor will produce even when it is cloudy. 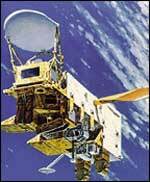 AMSR-E began sending data on 1 June. Initial (uncalibrated) data have produced impressive images of the Earth's surface. Recently however, AMSR-E has had some problems that engineers are evaluating. In the brightness image, ice and snow cover show up in white and yellow, desert areas in shades of green, other land areas in dark colours, and oceans in shades of blue. "These engineering images are great, which tells us that we have a healthy spacecraft and all instruments are performing nominally. "Everything indicates that we are on schedule to go operational in early September," said Phil Sabelhaus, Aqua's Project Manager at Nasa's Goddard Space Flight Center.